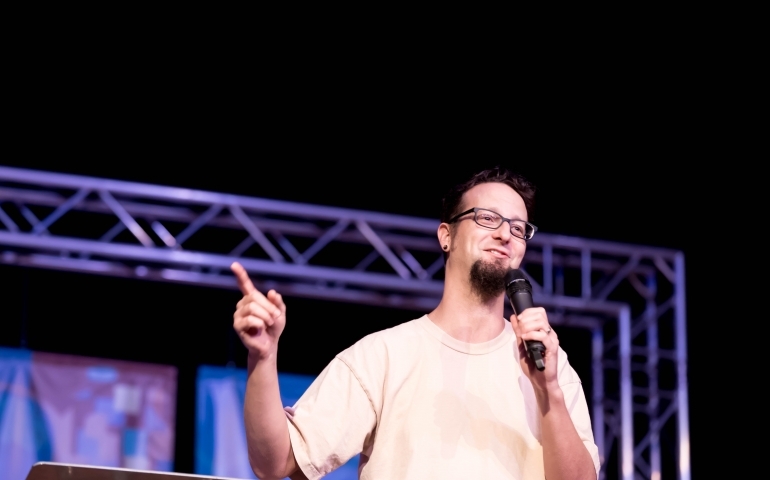 On Tuesday, October 9, Shane Claiborne brought a perspective-shifting message to Southern Nazarene University (SNU). While passionately declaring the gospel, Claiborne challenged the Church to step outside of traditional Christian ideologies and to embrace the world without hesitation. Shane Claiborne is a Christian activist and author who strives to live a life that fully reflects the heart of Jesus Christ. He has spent years advocating for the poor and opposing the death penalty. He lives a life that challenges American Christianity, which is why many SNU students and faculty were eager to hear him speak. Claiborne is a naturally powerful communicator. His ideas flowed through his language with ease and engaged the crowd in unique ways. His stories were inspiring, and he delivered his message with eloquence, but it was his passion for the gospel and the authority that he used to present it that lit the service on fire and gave true life to his words. The ideas that Claiborne communicated may have been uncomfortable for some, but that was undoubtedly the point; his goal was to challenge the way that SNU students think. In a moment that caused many in the crowd to burst into applause, Claiborne compared Black Lives Matter to the Beatitudes found in Matthew 5, and while many were inspired by this comparison, it may have made some students uneasy. Claiborne argues that this discomfort is fundamental to the message of Jesus Christ, and he encourages people to embrace that. Claiborne’s words may have been challenging, but SNU student, Reagan Haydon believes they were needed. The kindness and passion that Claiborne used to communicate such shocking ideas with, is exactly what the Church needs. Reagan described it as a loving hit to the head, something that can wake people up and open their eyes to the truth. The goal of Claiborne’s message was not to condemn, it was simply to get students thinking. There is value in hearing ideas that make you a little uncomfortable or make you want to move. The gospel ends with a call to action, and Claiborne’s goal was to communicate this call in a fresh way. When asked what his best advice for SNU students is, he responded with a simple phrase, “Connect your passions to the pain you see in the world.” If anything is to be taken away from Shane Claiborne’s message, it is that you do not have to be an important person to make an impact; you simply have to be willing to open your eyes and be made uneasy by the pain and the reality of the world we all live and be willing to sacrifice something, the way that Christ sacrificed for us all.